Summary: Meryl Becker is living a mother’s dream. The oldest of her three beautiful daughters, Meg, is engaged to a wonderful man from one of the country’s most prominent families. Of course, Meryl wants to give Meg the perfect wedding. Who wouldn’t? But when her two younger daughters, Amy and Jo, also become engaged to celebrated bachelors, Meryl has to admit that three weddings is more than she and her husband, Hugh, can realistically afford. The solution? A triple wedding! At first, it’s a tough sell to the girls, and juggling three sets of future in-laws is a logistical nightmare. But when Hugh loses his teaching job, and Meryl’s aging mother suddenly moves in with them, a triple wedding is the only way to get all three sisters down the aisle. When the grand plan becomes public, the onslaught of media attention adds to Meryl’s mounting pressure. 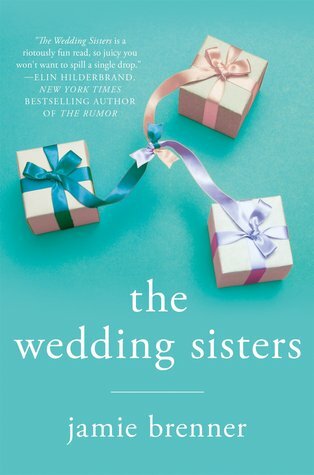 Suddenly, appearances are everything – and she will do whatever it takes to keep the wedding on track as money gets tight, her mother starts acting nutty, and her own thirty year marriage starts to unravel. When I first saw this cover, I *may have* done a bookish dance of joy. I loved the cover, loved the presents, and really just thought it was absolutely fabulous. Listen, I’m not married. I don’t have daughters to plan weddings for. So, I can’t say exactly how I would act if my daughter’s fiancee’s were willing to take on a major portion of the financial planning of the wedding, but I think I might would consider it. Just saying, Meryl. Hugh. Man, ole Hugh when you decide to step into it and make stands- you do so in a big way. But you need to think, man! THINK! The book is a contemporary family drama- on the outside, the family looks perfect. Each daughter is engaged to a man that is wealthy, social class of the highest order, and all that jazz. It’s all like a Tiffany’s box. Perfect on the outside. And in the box- well you just know the inside is a perfect as the outside, right? In the case of the girls and the upcoming nuptials- not so much. This record march down the aisle will have people facing reality, making tough choices and learning 2 things: Be true to yourself and family is always, always the most important thing. Bottom line: It was a like, not LOVE book for me. But def worth a read- especially if you are a Little Women fan.